Some more examples of the MacBeth Color Checker chart, but with wrong, some extremely so, white balance settings in the camera. Fig. 8: Nikon D200 images with wrong white balances, before (top row) and after (bottom row) calibration. From left to righ: CIE D65 lighting and CIE A white balance, TL84 lighting and CIE A white balance, TL84 lighting and CIE D65 white balance, CIE A lighting and CIE D65 white balance. Note that for the first image image we had to use a -1 exposure bias to avoid saturation of the blue channel in too many patches. This, however did not work for the last image, where many patches were saturated in the red channel. Fig. 9: Canon 10D images with wrong white balances, before (top row) and after (bottom row) calibration. From left to righ: CIE D65 lighting and CIE A white balance, TL84 lighting and CIE A white balance, TL84 lighting and CIE D65 white balance, CIE A lighting and CIE D65 white balance. The last case could not be calibrated because too many patches were saturated in the red color channel, even with a -1 stop exposure bias. Some more examples of the MacBeth Color Checker chart, with different exposure bias settings. Fig. 10: Nikon D200 images with different exposure bias, before (top row) and after (bottom row) calibration. From left to righ: 0, -1, and +1 stops, all with CIE D65 lighting and automatic white balance. 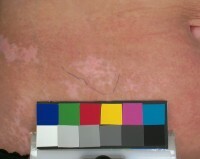 The strongly over-exposed image on the right could not be calibrated due to saturation of many of the patches. Fig. 11: Canon 10D images with different exposure bias, before (top row) and after (bottom row) calibration. From left to righ: 0, -1, and +1 stops, all with CIE D65 lighting and automatic white balance. The strongly over-exposed image on the right could not be calibrated due to saturation of many of the patches. Note again how the Canon white balance is superior to that of Nikon. From these examples it is clear that it is always better to (slightly) underexpose than to overexpose! Some examples of skin imaging. Fig. 12: Nikon D200 images of the same leg ulcer at different times, before (top) and after calibration (bottom). Note the differences in colors and luminance, and the green-yellow veil in the top row. Fig. 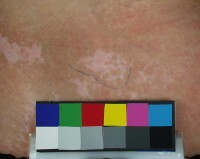 12: Olympus CL2500 images of the same vitiligo lesion, taken just seconds apart and with the same camera settings, before (top) and after calibration (bottom). Note: the chart is a custom made chart, but uses the same paper as the MacBeth color checker chart.